We’d love your help. Let us know what’s wrong with this preview of Small Towns, Fairy Tales, And Nora Roberts Land by Ava Miles. From USA Today Bestselling Author Ava Miles of the #1 National Bestseller NORA ROBERTS LAND comes a heartwarming collection of the first three novels in her bestselling Dare Valley series of love, second chances, family, and suspense. 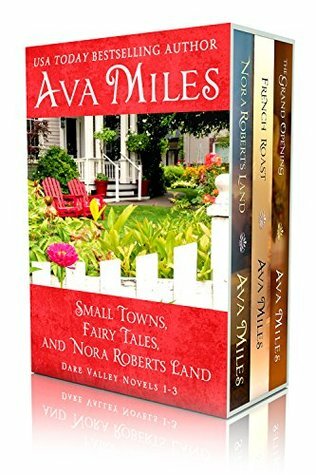 "I am adding Ava Miles to my list of alway From USA Today Bestselling Author Ava Miles of the #1 National Bestseller NORA ROBERTS LAND comes a heartwarming collection of the first three novels in her bestselling Dare Valley series of love, second chances, family, and suspense. A journalist returns to her hometown to debunk the Nora Roberts novels her ex-husband blamed for their divorce only to discover happy endings exist. A small town girl mixes business and pleasure with her childhood BFF until his own Mrs. Robinson returns, making her question their friendship and newfound love. A cynical single-mom cop discovers she can't bluff her way out of love when a mysterious poker-playing hotel magnate shows her it's worth the gamble. Author's Note: All books can easily be read as stand-alone stories. To ask other readers questions about Small Towns, Fairy Tales, And Nora Roberts Land, please sign up. Read 10% of this book and stopped. Should have put it down earlier. Ava Miles writes books that speak to the soul and the heart while being extremely entertaining with an unforgettably suspenseful romance. I've read three of her books thus far, not from this series, and she has never let me down. Her books always end with the happy ever after ending, leaving you with the satisfaction found in living in small towns. I've attached here my review of book 1 of this 3-book set. I highly recommend her writing style, her stories and the she-made-be-feel-good feeling. Ab Ava Miles writes books that speak to the soul and the heart while being extremely entertaining with an unforgettably suspenseful romance. I've read three of her books thus far, not from this series, and she has never let me down. Her books always end with the happy ever after ending, leaving you with the satisfaction found in living in small towns. I've attached here my review of book 1 of this 3-book set. I highly recommend her writing style, her stories and the she-made-be-feel-good feeling. About the Story: Meredith Hale is running, from herself and from her ex. She hasn’t been able to move beyond the divorce, although she was strong enough to accomplish getting it. She needs a change of scene so decides to couple her need with lending a hand to family living in Dare Valley. Her dad and grandpa own a newspaper in there and her dad has recently suffered a heart attack. Meredith has been in New York for several years and has proved to herself and her family that she’s has the family talent when it comes to journalism. Now her ex is threatening her, although in this story, she is the last to know. She promised her New York boss an unusual and unique article on looking for and finding, or not, the perfect man such as the ones found in Nora Roberts’s novels. And Meredith, buried deep within her heart, wanted to find her small-town Nora Roberts hero. What better way than in Dare Valley, helping her dad and grandpa and herself? Her secret weapon is her La Perla bustier lingerie, purchased with money she got from the divorce, AND her alter ego who constantly gives her advice, who she names Divorcée Woman. Could happy endings be possible? Well, she was willing to find out. Tanner McBride has also found his way to Dare Valley, but not for altruistic reasons. He’d recently returned from Afghanistan as a war correspondent, contacting a major newspaper which just happens to be the newspaper owned by none other than Meredith’s ex. But before he could work for him in the capacity he wanted to, his boss wanted him to ‘prove’ himself in Dare Valley. It all came with a nice little package of blackmail. His boss was paranoid that whatever Meredith was going to write would hurt his chances in his run for Senator. Tanner’s mission was to make Meredith fall in love with him and then break it off, so she wouldn't have the story she was planning on writing. Even though Tanner disliked this assignment handed him, he had no choice, no choice at all. And no choice in how he and Meredith connected, sparks and all. My Thoughts: I don’t normally read many contemporary romance, but I make exception for a few authors. Ava Miles happens to be one of them. This is the third book I’ve read of hers, however not in the same series. In each case, they have been warm, real, sweet romances that seize my heart. This particular story revolves around the love of family, both of Meredith and Tanner’s. With that love, comes need to protect even when one has to lie or tell half-truths. The story also shows that once you’re found out, it just may hurt more than if the truth had been spoken. Both Meredith and Tanner had difficulty telling untruths and I commiserated with both, knowing they had little choice. Both of them despised themselves in part because of it, yet felt truth would hurt more. This story has secondary stories other than the main ones, which gives it quite a bit of depth and interest where friendship, love and honor all are part of it. Many suspenseful moments await you, laced with fear, sometimes passion and other times humor involving more villains lurking to strike. A heart-warming, entertaining story, yet with an edge of suspense and mystery of a woman who falls in love with the wrong man, or so she thinks. Should she trust her heart or her logic? Her predicament leads her where her brain dare not go--with pitfalls of heartache along the way. I do like these books, but I wish the women were more trusting of the men who fall in love with them. It becomes frustrating to read. Each couples love story is so good. I love how strong the women in the stories are. And how important the focus on family first is so inspiring. International Bestselling Author Ava Miles joined the ranks of beloved storytellers with her powerful messages of healing, mystery, and magic. Millions of readers have discovered her fiction and nonfiction books, praised by USA TODAY and Publisher’s Weekly. Women’s World Magazine has selected a few of her novels for their book clubs while Southwest Airlines featured the #1 National Bestseller NORA International Bestselling Author Ava Miles joined the ranks of beloved storytellers with her powerful messages of healing, mystery, and magic. Millions of readers have discovered her fiction and nonfiction books, praised by USA TODAY and Publisher’s Weekly. Women’s World Magazine has selected a few of her novels for their book clubs while Southwest Airlines featured the #1 National Bestseller NORA ROBERTS LAND (the name used with Ms. Roberts’ blessing) in its in-flight entertainment. Ava’s books have been chosen as Best Books of the Year and Top Editor’s Picks and are translated into multiple languages.